these issues in writing and requested a written response to each from Dr.
Superintendent’s responses on April 1.
termination from her teaching position. reasonably and fairly addressed by the administration. fear” that remains prevalent at all levels of the NBPS. What about Unit B members? Are they still represented by the NBEA? You think the unit A members have taken a beating…. The unit B members have been lambs to the slaughter. I stayed until the end of the last meeting in December but it did last a long time. Hopefully if there is any voting to be done or anything it will be done within an hour of the meeting before people have to leave. Many people started heading out about 4 at the last meeting. Let's keep time constraints in mind for the planning of the meeting. Unit B members? Are those the administrative members? You have been like lambs to a slaughter? Have you thrown anyone under the bus for the sake of your own job? Yes, please do not drag this meeting out. We all know how important it is, that's why we're attending. No more than 30 minutes of presenting the case, we are all well aware of the abuses that have gone on. We do not want to start out with 800 members at 3:15 and start talking about serious decisions when half of our members have to leave for family commitments etc. If members can't give an hour up for the future of this district on Friday, they better get ready to give up many more hours of family time next year. This administration has no concern for your personal life. Get to the meeting, stay at the meeting, make it your top priority for one Friday afternoon. This includes the teachers from “out of town”. Be seen, be strong, be proactive. VOTE OF NO CONFIDENCE IMMEDIATELY!!!! just for clarification-the unit b members include directors-which there are none left at central office and assistant principals. The MAYOR is posting on this blog under a false persona. BEWARE, he is now trying to save face (public image) and PROTECT himself by reaching out to some with disingenuous MOTIVES. It has nothing to do with “giving up an hour” for the future of the district. I sat through the entire meeting in December, as well. Most of it was the same old rhetoric. Everyone has been hurt, everyone has an axe to grind, but as a previous post says, we have all experienced it and we have heard the stories. frankly, I thought staying for the entire meeting in December was a waste of my time, but I stayed in solidarity. I will definitely attend on Friday, but I hope it is short and concise. We all give WAY too many unfounded hours every week!!! I hope that everyone will attend this meeting on Friday; we have suffered enough abuse at the hands of administration and it is time for members to start speaking out. The only reason that one violent attack on a teacher was brought to the public's attention was that one student video-taped it, against school rules, I might add. If others don't speak out, this will be treated as an isolated incident. If you don't want the abuse to continue, it's up to you–to all of us! When we advocate for ourselves and our colleagues we are also advocating for our students. If you are not deeply disturbed by the actions of this superintendent you have not been paying attention. In military service the saying goes, All gave some-some gave all…in NBPS it is, All gave all-all gone now. 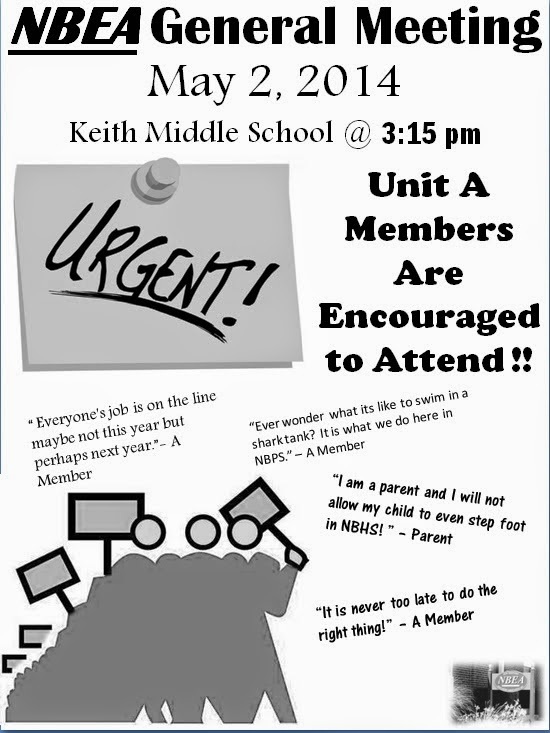 If you are willing to participate in an unpaid SILT meeting, you should be willing to attend this gathering of fellow teachers. That is all. I agree … It is not about giving up an hour of time it is about standing together and sending a strong, unified message that may very well affect your career for years to come … Surely this merits the valuable time of every member! We should ALL be STANDING together and standing STRONG. Let's send a STRONG message to the Mayor and School Committee that we are all UNITED.Our elected School Committee and Mayor have let us down on many fronts. Remember, today you may not be a target, however, that could change by the end of the school year or next year. No one is safe under the Reign of Durkin the Terrible!See you Friday. NBEA STRONG AND UNITED. Enough is Enough!!! !Someone is going to get seriously injured, before something is done. Everyone needs to attend. The climate of our schools is deteriorating rapidly. Roosevelt has had THREE fires set in our bathrooms this week. If a member is on leave for any reason, is it right, proper, or safe for them to attend the meeting. I can only imagine hearing the line, “if you're well enough to attend a meeting you are well enough to report to work. I am truly sick of this system, administration, and working condition. A child in my son's class threw a desk and a chair which hit 5 students including my son. There was never any communication from anyone at school about this event. My child attends what i consider to be the best school in the district, not only has this type of incident never happened there used to be an abundance of communication between the home-school community. something has changed and i don't know what it is. WOW! That's an assault and should be reported to the police. What the heck is going on in these children's lives? I hope your son is OK, but it must be frightening for you to send him back to that classroom. Go ahead and post the name of the school. That is the only way we can hope to help. The Elephant’s New Clothes: Governor Deval Patrick ears from The Elephant.